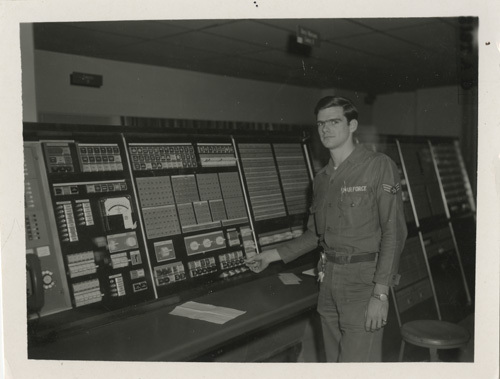 The donor writes: "Buck Sargeant Richard Haskell at the duplex maintenance console. The Q-7 was a duplex machine with one active computer and the other computer on standby just incase. They were routinely switched at midnight. In my 4 years as a Q-7 tech I remember only one unscheduled switchover. The meter and panel on the left next to the phone is used for marginal checking. The Q-7 used 28,000 vacuum tubes on each duplexed machine. Marginal checking would vary the filament and B+ voltage while running high-use software to detect future failures."